Silkroad Secrets has researched to give you more information about the skill updates and also tested the game version shown in these videos. Do recovery division and healing orbit change? No, these skills will stay as they are at the moment. This skill will also not undergo any changes. How can I kill mobs without bless spell? People who can not grind without bless spell are noobs. What other changes will happen to warriors? Warrior's screens will disappear when they change their weapon to a non-warrior-weapon. How will the chinese chars become stronger? Theimbue attacks will have higher mag. atk. 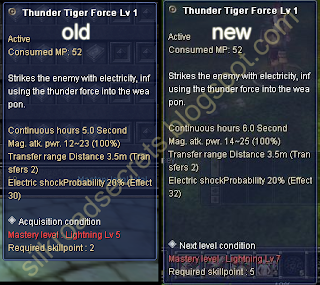 power or better abnormal effects and the moving speed skills will get a higher effect (maximum 110%). Nukes' attack power will not be changed. Bicheon skills' attack power will be slightly decreased (like from 150% to 143%), other weapon skills will not be changed. I have made a picture to show you the first imbue skill in the Lightning series. edit: Synx has worked on a complete table of changed skill's damage. Thanks for that! The euro skill changes with bless spell were only applied on jSRO! Holy spell got 50% probability on kSRO, but 100% in jSRO. question: what about the warlock debuffs will they disappear when wepon is changed? Are there any change at the Fire Shield Series? Can i share informations on a different forum with credits? Fire Shield will stay the same. If you post information from my blog somewhere else, post a link to my blog as source!" pfff!!! again SRo Forget To the GLAVIES! -.-! will the skills like haeling orbit/cycle be changed or wizard skills? @Anonymous Both skills are level 5. On the first pic I did not level it, on the 2nd one I did so it showed level 7 as next level. i heard an rumor that chinese chars would get some skills lik LifeTurnover or so what do you think of that.. The imbues will get stronger, since it gets +1 sec time. Why do the bicheon skills dmg get decreased? They are already weak against eg. glaviers, lol. Will the cool down time for Xbow skills be increased?